My pickle experiment was moderately successful. 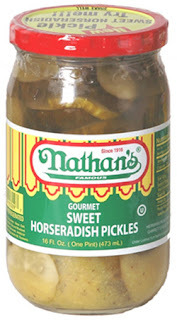 I've created a pickle more interesting in flavor than a regular bread and butter pickle, however my concoction is not as great as Nathan's. You must try a sweet horseradish pickle a.k.a. a Horsey Pickle when you get the chance.